As I wrote in our January 1 issue, GEN turns 30 this year and we invite you to join the celebration. We have a number of events and activities planned throughout 2011, so look out for them. For instance, each issue in 2011 will feature a reprinted article from one of GEN’s earlier issues because of its particular importance and relevance to the development and evolution of the biotech industry. In our January 1 issue, we ran Ronald Rosenberg’s story on Mark Ptashne’s decision to form one of the first biotech companies, Genetics Institute, without any assistance from Harvard University. The story, which originally appeared in the first issue of GEN (Vol. 1, No. 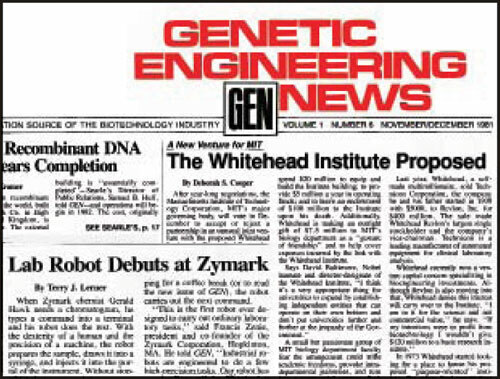 1, January/February 1981), demonstrated the reluctance of many academic organizations to become involved in commercial ventures during the early years of the developing biotech industry. While largely a thing of the past, one very occasionally still runs into a professor or researcher who balks at the idea of combining science and business. Below you will find another article from GEN’s first year in the publishing world. This one describes the appearance of the world’s first laboratory robot. While ubiquitous now, the little electronic lab assistant introduced by Zymark represented a key event that significantly helped biotech scientists to carry out their research more efficiently and economically. We encourage you to comment on the article on our website, www.genengnews.com. Feel free to discuss, for example, the historical development of lab robots, the role they play in research today, or where such technology might be headed in the future. We are extremely interested in what you have to say! When Zymark chemist Gerald Hawk needs a chromatogram, he types a command into a terminal and his robot does the rest. With the dexterity of a human and the precision of a machine, the robot prepares the sample, draws it into a syringe, and injects it into the portal of the instrument. Without stopping for a coffee break (or to read the new issue of GEN), the robot carries out the next command. Standing some 2 feet high and 15 inches square, the Zymate Laboratory Robot takes up no more bench space than an ordinary laboratory ringstand. It comes equipped with a selection of interchangeable modules, “hands,” “fingers,” and paraphernalia that enable it to pick up to pipette, pour, push buttons, and perform any number of manipulations within an arm’s reach. The controller, a system of microprocessors, supervises the entire process from user to robot to modules. “The system is capable of automating just about any lab process,” Zenie pointed out. The initial modules provide basic liquid handling and mixing, time and temperature control, and some instrument interfacing. New modules now under development include automated extraction technique, external electrical and events controls, and additional liquid handling abilities. The robot will be formally introduced at the Pittsburgh Conference on Analytical Chemistry and for Applied Spectroscopy in Atlantic City, N.J., March 8-13. The Zymate System, which includes the robot and the controller, will be ready for summer delivery for under $20,000. The Zymate Laboratory Robot is the first in line of automated laboratory instruments developed, manufactured, and marketed by the ten-month-old company. “We’re an unusual firm,” admits Zenie. “We didn’t have a product direction so we decided who we wanted as customers and found out what they needed.” They found sophisticated spectrometers and chromatographs to make the measurements, computers to break down and analyze the data, but no effective technology to automate the routine operations required to prepare the samples. “Sample preparation hasn’t received the attention nor made the progress. We decided to start there,” said Zenie. If you call Zymark, it is likely that Zenie, or one of the company’s two Ph.D. vice-presidents, will answer the phone. Founded last March, the company now has a staff of nine. Headquarters in Hopkinton, outside of Boston, is a 6,000 sq. ft. building housing the company’s offices, laboratories, and manufacturing plant. The company’s second product is an educational manual, Zymark’s Program in Sample Preparation Technology, which is now available from Zymark on a subscription basis.